The origin of the blue light legend is often said as having come from a sighting that took place in 1970 by Jack Hermanski of Illinois. He described a blue light from within the cemetery that grew as large as a basketball, blinked in ten- to twenty-second intervals, and rapidly changed positions. He had also reported the light on at least two different occasions. A Southtown Economist newspaper article from 1990 quoted researcher Richard Crowe of Illinois as saying,"In the 1960s, there were reports of a blue ghost light there." Given the long-term research efforts by Crowe this would clearly indicate that a blue light had been reported prior to 1970. Sightings have placed the light moving up and down the old Midlothian Turnpike south of the cemetery as well as moving among the headstones. On rare occasions the light has been accused of pushing people to the ground even though there have been no clear indications of any up-close physical contact. Various references describe the light as being about the size of a softball, pool ball, and a small basketball as well. Legend has it that the light often appears on clear moonlit nights, though it has also been reported to appear during daylight hours. The only commonality to the sightings, short of it being the color blue, is that it has an apparent intelligence to it. Besides the extreme case of being chased, one indication of intelligence includes the light continuously fading from view when witnesses approach it, then a moment later it will reappear behind them. According to an audio transcript of a speech given by a local school teacher, there is supposed to have been an incident in 1963 about three young boys lost in the woods in the vicinity of the cemetery that was printed in the newspapers. When the boys were initially found by police on 143rd Street after being lost for a couple of weeks, all three of them could only speak about a "blue light" and nothing else. Within that same time period five young men witnessed a blue light from within the forest adjacent to the cemetery. At approximately 2:00 A.M. during late Fall of 1963, all five men were standing on the north end of the pond next to the now defunct car pull-off when the light traveled over the water toward them. Out of fear, they all ran back to their car and were chased by it as they drove away on 143rd Street. While the driver was turning his head to get another look at the light, they wound up sliding off the road into a cornfield which resulted in stalling the engine. After a moment of silence among the men, the light reappeared hovering over the front right-hand side of the car. The light proceeded to hover three times around the car, continued over the same cornfield where all the men were watching, then crossed over 143rd Street and drifted off into the forest. It was described as being transparent and about the size of a basketball. Although the exact direction of travel, as well as the specific cornfield is unknown, among the five men that witnessed the light was the school teacher himself. It is said that he was told to stop giving his speech in school but it is hoped that one day, possibly during retirement, that he will come forward with additional information. Any students of his that wish to share their experience of his speech are welcome to respond as well. Some time during the 1970s Deanna Vaught of Illinois witnessed a "blue light in the trees" while driving with her father. The father could not give an explanation for the light but later on in high school Vaught learned that a blue light had been reported within the trees in the same area. The road they were traveling on was not mentioned, but it was in close proximity to the cemetery. In 1971 Denise Travis of Illinois reported to Richard Crowe that she was able to pass her hand through a blue light but felt no change in temperature or anything else out of the ordinary. She is currently the only person to come forward claiming to physically interact with any ghost light associated with Bachelors Grove cemetery. One reference worth noting is a confusing statement in the 1994 book Haunted Places: The National Directory. On page 155 it states that in 1971 a woman was able to "put her hand right through the ghost of a figure down a path in the cemetery." The quote is strongly believed to be in reference to the same woman passing her hand through the blue light. A more serious statement to consider is a reference to the same woman in 1971 within an article from the National Examiner in 1984. Within the article it states, "A teenager who had a brush with the sinister light a few years ago put her hand through it, she and her companions later insisted." This would indicate that more than two people were present. But an interview with Crowe in 2011 indicates she was accompanied by only one other person, possibly her sister, whom also witnessed the event. In 1987 Ted Visnec of Illinois spoke of an experience with a blue light during a WLS television broadcast in Chicago. He spoke of himself and his associates all witnessing a "deep blue light" over the old Midlothian Turnpike south of the cemetery. They first saw it on the western end of the road adjacent to the southwest corner of the fence to the cemetery. It then proceeded to go "up and down the path" and came near the main entrance to the cemetery on the south end. While he was standing near the main entrance he "thought somebody pushed me, cause I went flying. I got knocked, you know, on my face." It is unclear as to the exact year in which the sighting took place but it is believed to have been in the early 1970s, most likely 1973. During what may be the peak to the blue light sightings occurring throughout the 1970s, Richard Crowe conducted an interview with police officers from the Cook County Sheriff's Department whom also claimed to have witnessed the blue light phenomenon. Occasionally the police themselves are questioned as being the source of the light due to the rotating lights on top of their car. The problem is that the departments patrolling the area are said to have only been issued red lights during the 1970s, but further research is required. There is a distinct difference, however, between watching a blue light and being chased by one. Today, you can even find a fair number of police officers, many of them employed within the Cook County Sheriff's Department, that will discuss stories handed down as fact by other, often veteran, officers. The majority of the stories happen to be about strange lights and it is said that some officers even refused to investigate them out of fear that they had nothing to do with people based on their characteristics. Other stories happen to be about murders that had taken place in very close proximity to the cemetery. According to the audio transcript mentioned above, some officers have even chased the light only to have it escape them and disappear into the woods. Witnessing the blue light had reportedly gone into a decline around the late 1970s, but it is still unclear as to when the phenomenon was first reported. Reports of the blue light continue to this day but are very rare, contain very few details, and the encounter is usually said as being brief. Current research efforts into recovering newspaper articles to substantiate claims of the missing boys in 1963 have not been successful. There is, however, testimony from multiple sources to support that newspaper articles do exist and the research continues. In 1974 Richard Crowe was quoted in the Chicago Tribune as saying the light "moves thru the swampy area onto higher ground thru the trees." which is much like the experience of the school teacher in 1963. He also stated, "I have about a hundred independent reports, many of them on tape." Those reports happen to be the origin to why the cemetery is often said to have "over a hundred reported sightings." Though it is unclear in the article if all of those reports are only in relation to the blue light or other encounters, further research indicates they are a general collection to various types of encounters. 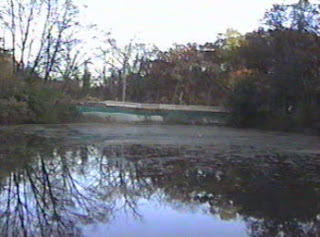 Found within an obscure 2000 newsletter called the Phantasmic News, a woman and her boyfriend published their personal experience of a "glowing blue orb of light" over the pond. It was later understood that the sighting took place in March but it is still uncertain if it occurred in 1999 or 2000. The sighting became more well known to the public after a Fox paranormal television series in 2000. Most of the footage was then recycled for an episode in 2008 aired by the Sci-Fi network. A young woman unrelated to their sighting was included on both programs and was also quoted in The Star newspaper in 2000 as saying, "They were like two blue orbs floating through the woods." The article goes on to mention that the woman was able to film the lights with an ordinary camcorder. What ever happened to the video footage of the blue lights is unknown. Unfortunately, the 2000 Fox footage is unavailable at this time for full review and there was no mention of it in the 2008 Sci-Fi episode. There was also no clear indication to photographs of a blue light from March, though a single unidentified photograph was briefly shown showing a "blue circle" within the cemetery. In more recent times the legend of the two-headed monster for Bachelors Grove cemetery has been found to include similarities with blue light sightings. 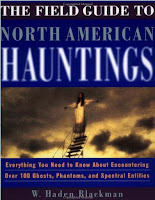 Within the 1998 book The Field Guide to North American Hauntings by W. Haden Blackman, on page 72 it states, "The grotesque creature wanders between the headstones, often accompanied by a legion of small, dancing blue lights." This same book also happens to be the origin of the blue lights being associated with the two-headed monster. According to Richard Crowe, however, the overall story of a two-headed monster has no true relationship with the cemetery.